The Hull-based art-rock duo release their first live-action video today, influenced by 1970s sci-fi film Alien - hence the low-budget spaceship background! The 'white blood' of the titles and chorus is a direct reference to Ash's death scene in the Ridley Scott classic. The imagery has been adapted into an abstract love story about a man who falls for a girl but soon discovers her true robot origins when she cuts herself, revealing her white blood. The two tracks featured in the video are taken from the group's debut EP of 14 one-minute songs. 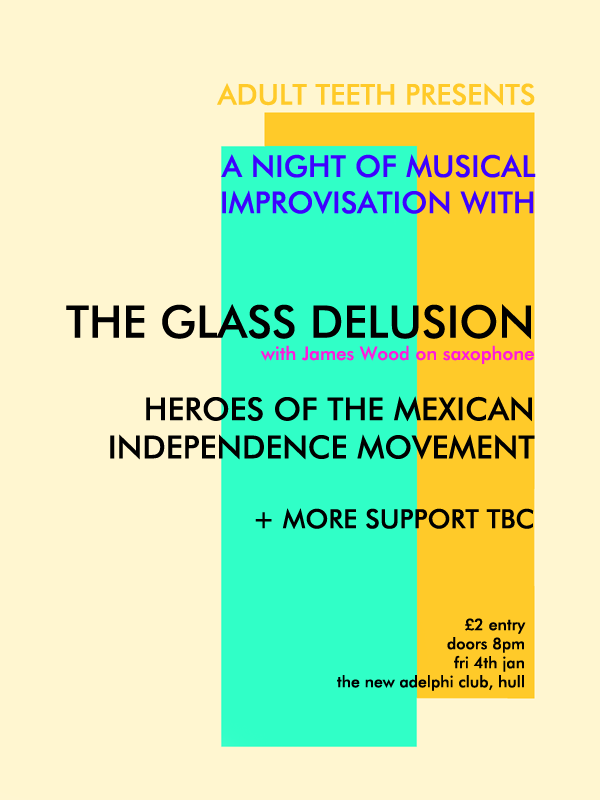 The debut EP by Hull-based art-rock duo The Glass Delusion is out now. You can stream and purchase the digipak CD or digital download via the above player. Available now on digipak CD and digital download from our shop. Click here. 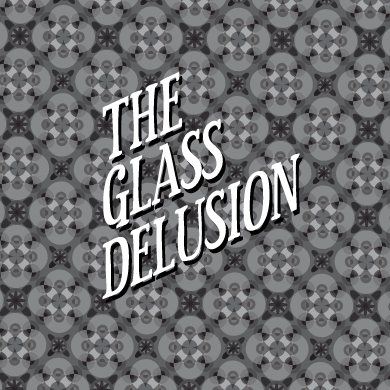 With great pleasure, we announce that the debut EP by The Glass Delusion (containing 14 one-minute songs) will be released on 17 June. Here's a tasty video to whet your appetite. Pre-order the full EP by clicking here! Click here to stream / download for free / purchase. The fully-improvised debut live album by the electronic musician MyOneManBand is available as a pay-what-you-like download from today. MyOneManBand is the instrumental alter-ego of Hull-born, Antwerp-based Phill Wilson, a spontaneous-composer who creates intricate improvisations using a table-full of electronic hardware, grooveboxes and looping devices. He has built up a loyal following on Youtube with his frequent uploads of his forward-thinking improvisations. 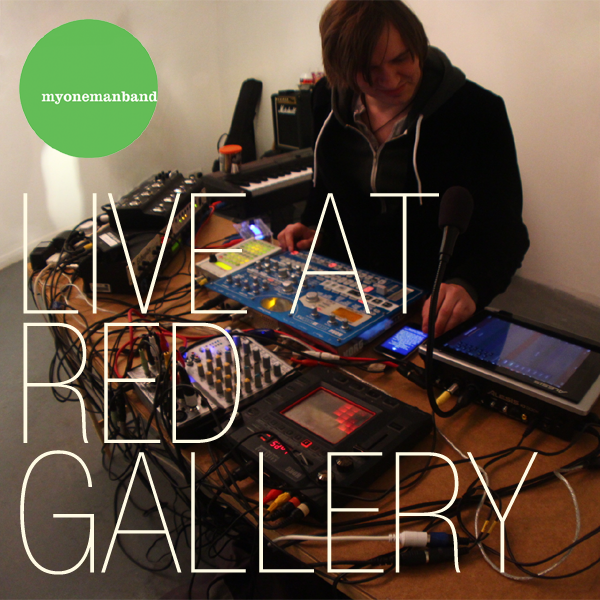 'Live at RED Gallery' is free to download, although listeners are encouraged to make a small donation - all payments are reinvested into the label and its musicians in order to create more uncompromised and exciting releases like this one. MyOneManBand's debut studio album ADAPTER will follow in September. The debut album by ambient-drone musician Mt. Judge is out today. You can listen to the whole thing for free in the player above. Click the Buy button to purchase the digipak CD or digital download. Influenced by Stars of the Lid, Emeralds and William Basinski, as well as the strong drone, ambient and noise movements of his former home city of Glasgow, Mt. 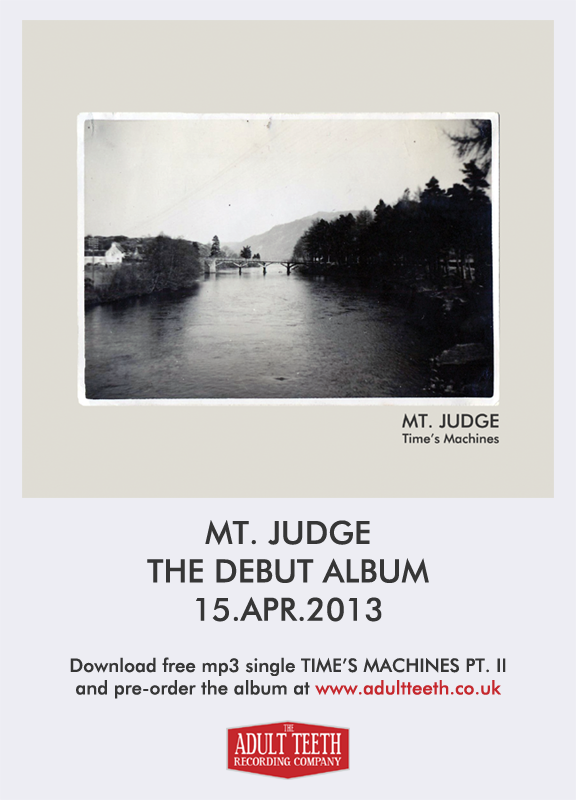 Judge's sound echoes the subtleties of Brian Eno and Boards of Canada. His debut EP, Not Always, was picked as one of the best free releases of 2012 by Wake The Deaf. Time's Machines expands on the techniques employed therein - subtle changes in the timbre and tone pulsating and vibrating around the listener, all the while filling every corner of the room. Available now on CD and digital download from our shop. Click here. 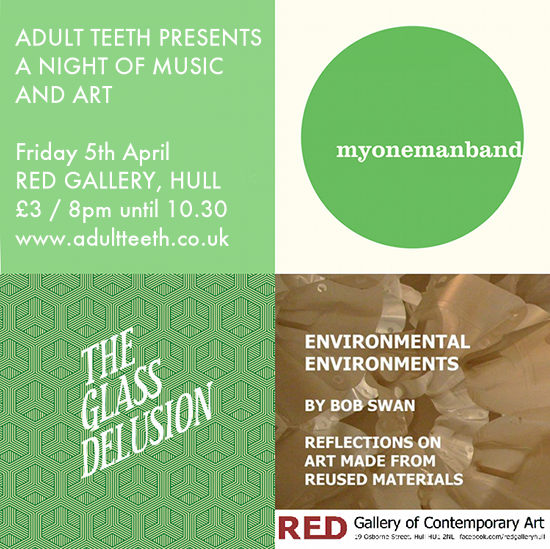 Ahead of the release of his debut album through Adult Teeth this Summer, MyOneManBand aka Phill Wilson performs an extended headline set of improvised electronic material in the intimate surroundings of Red Gallery, Hull. Phill has asked for audience members to bring along 'found sounds' - household objects that made a sound when struck or shaken - for him to sample live on the night and work into his set. We encourage you to bring something along! All items will be returned! Performing in support of MyOneManBand is The Glass Delusion vocalist and guitarist Lewis Young, who will be playing acoustic versions of the band's art-rock songs. The group themselves will be releasing their debut EP in June, which is comprised entirely of one-minute songs - 15 in total. But opening up the evening is the artist Bob Swan, who will be delivering a short talk about his exhibition of structures made from recycled materials, currently on display in the Red Gallery. The exhibition itself closes on April 6th, so this is a great opportunity to catch the show before it ends. Both MyOneManBand and Lewis will be performing with Bob's artworks as a backdrop. Click the Buy Now button to get your ticket. We're extremely pleased to announce the debut album by the London-based ambient musician Mt. 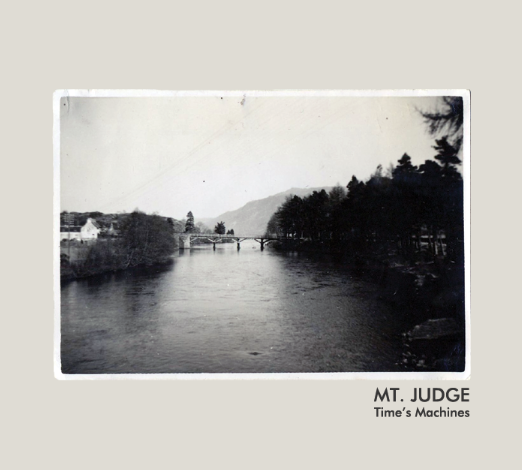 Judge, entitled Time's Machines. To celebrate, we're giving away a free mp3 single, taken from the album. You can download it now by heading to the link below. The cover artwork is a black-and-white photograph of a river leading to Loch Ness, taken in 1948. The photo was unearthed by Mt. Judge in a Glasgow charity shop. 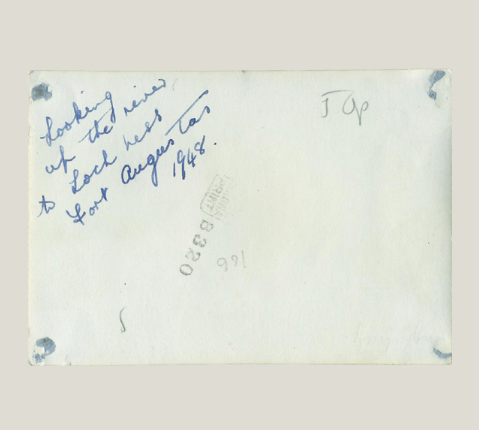 The inside cover of the album displays the reverse side of the picture - with inked caption by the anonymous photographer; the photo developer's stamp; Blu-Tack remnants; and the price penciled on by a charity-shop volunteer. The life story of a mysterious photograph, documented on the debut release by Mt. Judge. 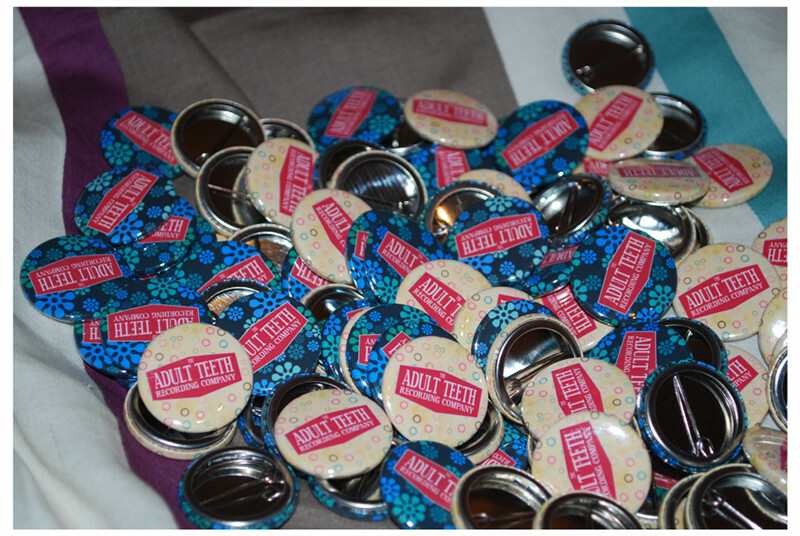 Free badge with every order, while stocks last. 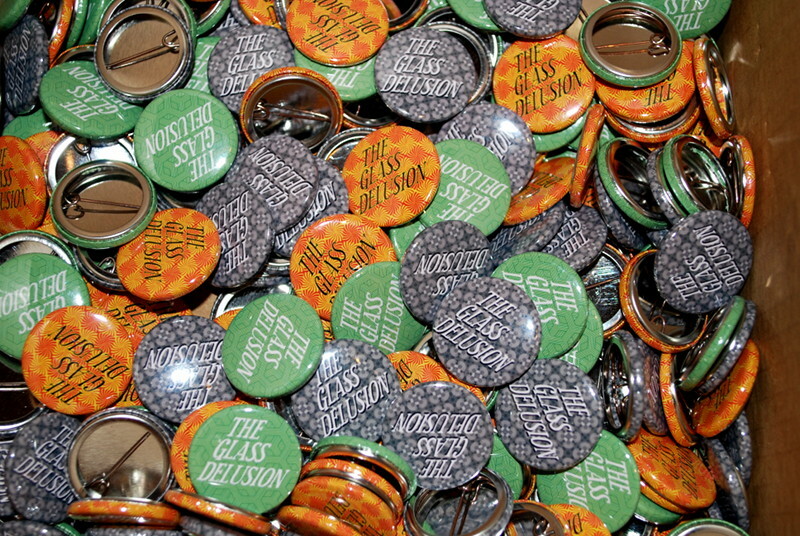 Order something Glass Delusion-related and you'll get a Glass Delusion badge too! When The Glass Delusion recently announced they had whittled down their live line-up from a four-piece to just two members, the general reaction seemed to be "Huh?" As of February 2013, the group has been stripped back to its core elements, leaving a minimal line-up of principal songwriter, vocalist and guitarist Lewis Young and drummer and backing vocalist Carlos Macklin. Of course, this means the Glass Delusion sound has changed - a reduced line-up encourages listeners to focus all their attention on what remains. Simply: vocals, guitar and drums. But why did this happen? One word alone is the key to this mystery: geography. The make-up of the group has been ever-changing since its inception. Phill Wilson departed in August to live a new life in Antwerp, leaving a large synth-shaped hole in the music, and the loss of Salbo Baggins to Mexico in January meant the songs would forever lack her inimitable viola skills. It is a pleasure to work with talented musicians such as Elektro Diesel, James Wood and the aforementioned Phill and Salbo, but the uncertainty that comes with in-demand people is difficult to build a band around in the long term. So a decision was made to enable the group to continue. The support that has been shown for The Glass Delusion up to this point has been humbling and encouraging, and we hope that it will continue to grow during this next phase. The new Glass Delusion will be going into the studio this March to record an EP for release this Summer. More info will be released in due course via The Adult Teeth Recording Company, and as always, the latest news and live dates will be announced via the channels below. Expect psychedelic freak-outs, twisted cover versions, madness of both the organised and unorganised kinds, saxophone solos, on and off-stage props and quite possibly (but not definitely) more besides - all of which will never be repeated. Entry is two pounds and doors open at 8pm. Come and have a drink (they have Brahma on tap now!) and enjoy this one-off night of music made up on the spot.